Requirements for the design of structural stability are given in the AISC 360 – 14th Ed. Chapter C. In particular, the direct analysis method provisions, which was previously located in Appendix 7 of the AISC 360 – 13th Ed., are described in detail. This method is considered an alternative to the effective length method which in turn eliminates the need for effective length (K) factors other than 1.0. Section C2.3(1) requires a stiffness reduction factor of 0.8 to be applied to all structural members' axial and flexural stiffnesses that contribute to the stability of the structure. The code further suggest to apply this reduction factor to all members whether they contribute to stability or not to avoid artificial distortion. 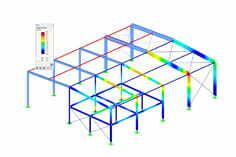 Additionally, the factor Τb should be applied to the flexural stiffness of structural steel members in the analysis. The factor Τb is a function of the required axial compressive strength (Pr) to the axial yield strength (Py) ratio. RFEM can effectively and accurately take into account these considerations for member stiffness reduction. Under the ‘Edit Member’ dialog box and the ‘Modify Stiffness’ tab, the user has the option to select the Definition Type ‘According to AISC 360‑10 C2.3(2)’. Here, all previously mentioned variables relating to the axial and flexural stiffness reduction are listed. The factor Τb can be set to ‘Iterative’ for the program to automatically determine this value based on the equations C2‑2a and C2‑2b or can alternatively be ‘Set to 1’. The user must also define whether the alpha factor used in these equations should be based on an LRFD or ASD analysis. Lastly, the flexural and axial stiffness multiplier factors are listed and set to 0.8 as defined by the Section C2.3(1).